Some may or may not know this bike, but it has been part of my life for more than just a few years. What you're looking at is a 1981 Yamaha XV1000 TR1, with approx. 113,000km, heavily modified 1063 engine, VM38 roundslide carbs, homemade stainless exhaust and quite a few suspension mods as in XS1100 forks and longer XT600 rearshock and quite some mods to the wiring harness, starter system and so on... Well, the kind of stuff you do, when an older bike is meant to be used DAILY. A while back, I've built a little turbo-setup for Yamaha XVs to have a bit of dragracing fun. And it was pretty good. Unfortunately, I can't always have fun with turbos and in all fairness there's this bike in my workshop, which does HEAPS more miles every week, than the turbo has done in the last two years. Now, my current engine is a classic "euro-style" TR1 engine build: XV1100 rotating assembly with 750 heads on a set of TR1 cases. This works to my absolute satisfaction and does the job just fine. Realistically it will push out a healthy 70 to 80 horsepower and tons of torque as low as 2500rpm. Putting 750 heads on a TR1/XV1100 engine pushes the compression up to a healthy 9.x, which spices things up quite a bit, but it comes at the price of breathability of the engine or in other words: The powerband ends at 6000rpm. and then basically built the engine until it was almost done. After a long chat with Sepp Koch and picking his brains and trying to get the info out of him, because quite frankly in the last 35 years the man has tried pretty much everything except forced induction on the TR1 and just KNOWS. As the numbers for the squishband-clearance and (what I consider) sensible compression matched with what I had calculated earlier, I decided to weld up a set of TR1 heads to decrease the volume of the combustion chamber and shorten the cylinders accordingly. Sounds like a straight-forward plan? the old XV1100 may kill some low-down torque, but should make the ol' girl rev-up even faster and keep the rotating masses under control. Awesome. I was watching the engine build on your blog. 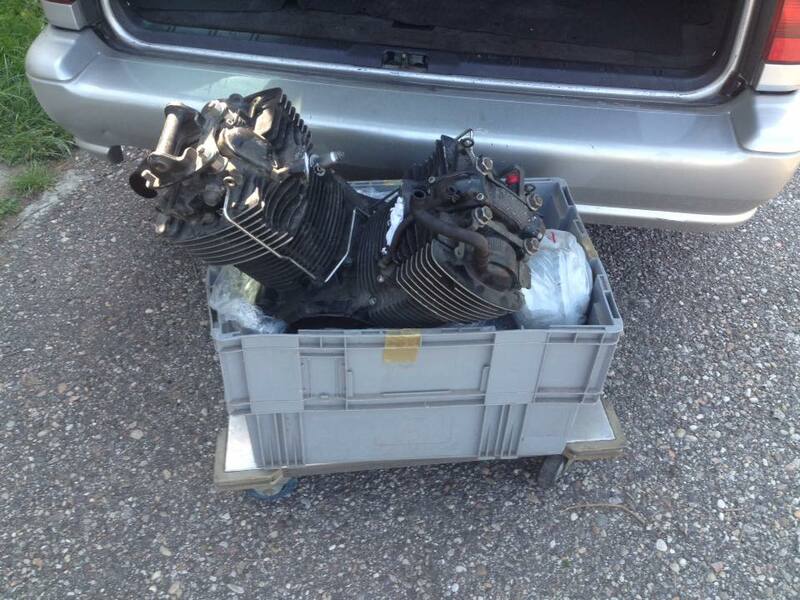 Those BT1100 engine sure have some nice covers on the top end. Well, just trying to get rid of some other projects, so I finally have the amount of time (and if needs be) additional funds to really dive into this build. And yes, this is gonna be awesome. The goal is simple: genuine 90 (euro, not SAE) ponies at the rear is the name of the game. I am still "a tad" busier than I admittedly like to be, but at the very least I was able to squeeze-in a little tooling upgrade. One of the tools that I absolutely had to build was a decently-sized flycutter to skim the heads after welding up the combustion chambers. For that reason, one is suppsoed to take an obscenely large (just shy of 5"/120mm) piece of (tool-)steel and chuck it in the lathe and square it up. Any old steel would have been sufficient, but this is what surfaced first in my stash. ... and turn a little centre-boss to shrink in. And as you have to mill down the flycutter's arbor on at least the side where you want to tap it, you might as well balance it and mill the backside flat as well. And this picture was actually taken BEFORE milling the backside flat, so it was completely out of balance and still, this was the kind of surface finish that was achieved in a single (interrupted) pass. Oh and that is roughly about the worst butter-grade ally that is known to man, so the finish on the much harder aluminium of the cylinder heads should yield much nicer results. Effectively, now the finish is good enough, so you can still see the ridges, but hardly feel them with your fingernail. Which should definitely do for the job and give the headgasket something to bite in. Next step will be to make a fixture for the cylinder heads so, I can safely clamp them down when milling and also have repeatable results. Now that this lovely flycutter is in the shop, it needs to be fed. So I grabbed an old XT500 head, which was really only good as a cooling-fin-donor and see if all I had thought up would actually work out in the real world. The biggest issue with all of this is to get enough heat into the casting and secondly find a filler that will actually work satisfyingly. Funnily enough, the 4047 (AlSi12) filler didn't work at all. It instantly crystalized and even if I did get it to work, well just look at the last picture. 5356 (AlMg5) was used and wetted out nicely and uniformly. As can be seen, a lot of "peppering" occured, even though the cast had been brushed and because that didn't yield satisfactory results even ground a bit with a handheld endmill. I suspect, with the real heads, I will have one or two cleaning passes and then grind out what I just welded up, to get rid of most of the imperfections. The flycutter on the other hand was an instant success. It doesn't care much for the welds sticking out and will take out 1mm just as it will do with 2mm (approx. 1/10"). The head has been decked 0.1mm (2 thou) just to see how close I can get it. It's hard to judge by the picture alone, but the finish is good enough for a headgasket. Next step is to find the best way to reshape the parts that have been welded up to give the combustion chamber its final shape. Which in the case of the TR1.1 will simply be straight. So I suspect, the main part will be done in the mill and only the last bit will be touched up with a die grinder. Well, the fixture is done and to be fair even the actual heads have already been welded up, but honestly the documentation is lagging behind a little compared to the actual work, which frankly is a good thing, because the other way round would be way more unpleasant. So here goes: 4 60mm of 30mm diameter ally roundstock as those XV-heads are one-piece items and as such don't have a valve-cover-gasket surface, one could index to. Now this is, where the tricky part comes in: How do you clamp something down, when you can't have a stud, nut, bolt-head protrude over the surface? Well, pretty much the same way a milling collet works, but pushing to the outside. Torquing the countersounk bolts down results in the heads of the studs spreading and thereby safely clamping the head down. I agree, I always use 5% Magnesium rods with all my bike work and am very happy with them, much better than Silicon. And here i was thinking that mg fillers were for mg alloys and si for si alloys. I wouldnt try to weld up old british dtd424 using AlMg fillers..
Not really working that much with alloy welding, but isnt most japanese castings magnesium alloyed aluminium? As a matter of fact it is and that's the big BUT, I was told by someone REALLY in the know of such matters, that I should try SI-filler, as he had great success on XT and SR cylinderheads and engine cases.